Where we’re headed with the Academy’s E-Learning ecosystem. This has already been done. We were going to use just instance of Google Apps at ncea.org.uk but decided against it. Why? Because we want to turn on as much functionality as possible for staff (e.g. Google Chat, Google Sites) whilst having the option of turning of these for students. Rolling out Google Apps to staff first enables them to play around with it and get used to a slightly different way of working before they start interacting with students through it. Automatically take screenshots based on keywords typed into any application. We need to have this in place before rolling out anything to students from an e-safety point of view. I’m planning to roll out Google Apps to students (nceastudents.org.uk) strategically. I’m going to start with the Sixth Form (ages 16-18) as they’re likely to be the most responsible and give the best feedback. Once I’ve collated, reflected, and acted upon this I shall then roll it out to Key Stage 3 (ages 11-14). Key Stage 4 may or may not get Google Apps depending on conversations I have with various people. Finally, Key Stage 2 students will get access to Google Apps on the Primary sites. This will start with Year 6 (10-11 years old) and work downwards. This should allow me to go into assemblies and iron out any problems as they happen. I had hoped that this would be completed by Christmas but because of various events that have taken place it may take a while longer. 4. Open up the Learning Platform to staff and students. We’re going with Frog for our Learning Platform. They are not only the market leaders in the UK, but have a track record of producing easy-to-use software which can incorporate and work with that from other providers. We’ll be looking – as other institutions are – to integrate Google Apps and Frog via a Single Sign-On procedure. That is to say, signing into Frog will automatically sign you into Google Apps. Student collaborates with another student via Google Docs. Students complete document, export as Word document or PDF and send to teacher through Learning Platform. Teacher takes submitted work and opens in their Google Docs area. Teacher stores students’ work in a relevant folder within Google Docs. You may wonder why I’m allowing only student-student collaboration and teacher-teacher collaboration. This is because I want the Learning Platform for the official submission of work and Google Docs for drafting, collaboration, and more informal interactions. At least in the first instance. 2. What do Frog say about SSO with Google Apps – are they confident they can do it, or will this be the job of your ICT Partner? 1. By ‘productivity’ software do you mean Microsoft Office? I’d beg to differ with that definition, but we’ll still have it installed for the foreseeable future. 2. Frog are willing to work with us enabling SSO with Google Apps. It’s also something the ICT Partner will be tasked with! Sounds like a great plan. As I think I mentioned to you before if we were to roll out Google Apps again, I think I would be very tempted by a two domain approach. One comment about getting feedback – in my experience sixth formers aren’t actually the best at giving feedback, it’s often year 10 and 11 do that better. Likewise (and I suspect there are other factors at play here), our experience is that year 10 and 11 have found the option to have G Apps the most useful – keeping work ‘safe’ both on and offline, and allowing those student who don’t have Office at home, but whose parents are suspcious of free software a way to access and create resources compatable with the school network. Thanks for the post, keep us updated – it’s fascinating to see what happens when you start with a blank piece of paper! What were your decision points for not having a single domain for staff and students – integration/sharing would be natural & easy with doc sharing. Sound like Frog could be a bit redundant? We were originally going with a single domain for staff and students. However, because features within Google Apps can’t be turned on and off for groups of users we (I) decided to go down the two domain route. This means that initially students won’t have Google Chat or Google Sites enabled. I’m toying with the same dilemma – one domain or two. My main problem is with document/site sharing – staff (inc senior managers) sharing with everyone in domain and not being able to easily select just staff. We currently run 3 Microsoft AD domains – staff, students and a resource domain for shared resources between staff and students. I was hoping to simplify this with the single GOOG domain but I, like you, may be forced to run two domains – hopefully there will be a way to SAML between them. Ultimately I want to only run a staff domain and leave students to self provision resources. Strategy looks good, though. I’m playing with postini at the moment, and it’s doing some very strange things. oh! That’s a great idea. I really like that idea of whitelisting miscreants. Can I borrow it, full credit given of course?? This means, of course, that you are free to use the idea however you like! Doug, I’m not quite seeing this. If pupils collaborate, export and send via frog, then teacher receives, marks and comments (presume it does feedback) via frog but stores doc in GApps and then the docs are dead-end. If pupil amends their work it will be the third doc. If sent as PDF, comments cannot be written on doc w/o converting. Not sure if frog has send back amended file feature. In Moodle you have to upload separate docs but at least they are stored in the same place so you can see the latest version. It seems an odd or incomplete workflow model. I am still thinking about, or trying to find the time to think about, how to work GApps and Moodle together as key tools in our learning platform. We don’t have GApps turned on for teachers and do not yet use Gmail and therefore functionality is somewhat restricted. However, my initial thoughts are using the share link in GDocs to paste into an online assignment which will allow collaboration with teacher and pupils (feedback via comments or footnotes), grading using Moodle gradebook, and a permanent track to the works timeline and progress – an electronic work folder if you like, maybe. However, all this is not tested yet.Not a frog user but assume it’s functionality is not too distant (for better or worse) from moodle. Very important discussion. I think you’re (understandably) conflating a system I’ve used before with that which I envision for the Academy. Once we’ve got that model sorted, *then* I may allow students to share documents outside of the ‘nceastudents’ domain. Informative reading there. 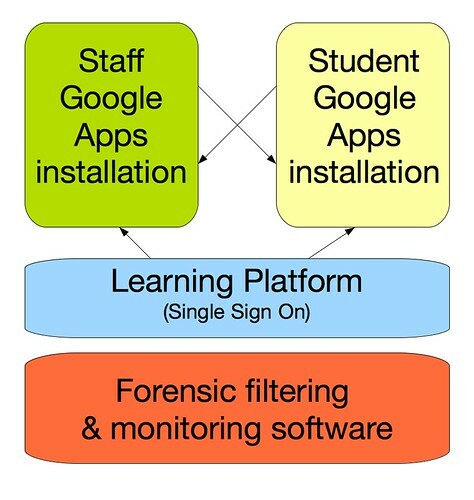 I’ve just got through sorting Google Apps for staff at my school and would love to be able to integrate SSO with Frog. Although I haven’t used Frog much yet, I can’t understand why you really need to use it when everything can basically be done in Google Apps for free. I will be working more closely with it soon, so any insight you have into ways to collaborate the 2 would be great.